When I first got a copy of 17 Down Under my thirteen year old son flipped through it and was chuffed to see a bunch of climbs he’s done. He can’t do that with a climbing magazine. Disclaimer: this is not an impartial review. I’ve been buying climbing gear from Rock Hardware for a couple of years now and have got to know and like Steve and John. I’ve been following this project with interest; just the concept sounded great when I first heard about it chatting in their relaxed store in Bendigo. So this is a personalised response to the book, as are the stories of each climb in it. When I think how climbs imprint in my memory it is the atmosphere around it: people, place, a bit of history, my state of mind… this is the tone of 17 Down Under and the stories are of climbs I’ve done. 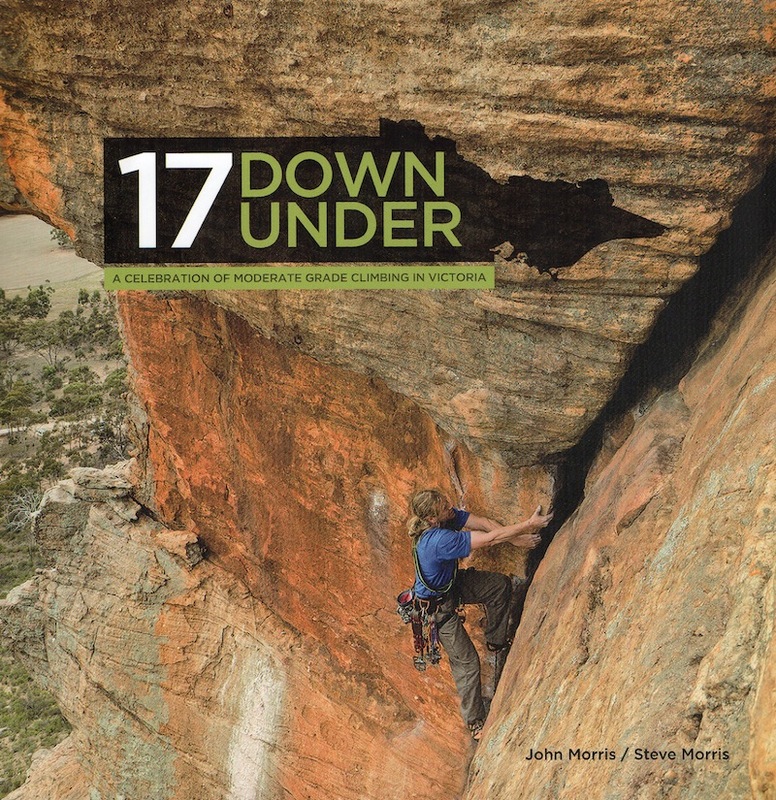 I was very pleased to see 17 Down Under make it to print; it was not an easy road but John and Steve persisted and this book is the payoff for all their hard work. They got through the long process to create something many climbers new and old will enjoy. This book is truly a celebration of moderate grade climbing: which is the sub-title. How rare is that? Climbing media is full of elite climbers, as if anyone climbing below grade 20 doesn’t exist. Yet I’m sure the audience who can climb over grade 30 is not big enough to sustain a climbing magazine or website. Sure we all admire, even aspire to this level of climbing but I believe it’s the relative challenge that is the satisfaction of climbing — getting a few moves on a climb above your grade is a great feeling. Thankfully for all of us there will aways be climbs to challenge us. I’ve enjoyed the fragments of stories and context in the guide books but even these give a scant survey of lower grade climbs; I’m often scratching to find enough stuff I can do, these books are of course made by higher grade climbers so there is little enthusiasm for the moderate stuff. For myself and a lot of new climbers the collection of climbs in 17 Down Under is a great tick-list. The book expands on each climb giving a personal account, more than just a topo and beta. It’s like chatting with friends about worthwhile climbs (but these friends are very experienced — both hold guide qualifications). There are also broader passages in the book like “why I climb” and photos of the places, people, and gear. You get the feeling this project was done within a community, there are contributions of words and images from many people. 17 Down Under comes also from within a family. One of the threads being Steve and Johns relationship: a father helping a son through the tough times of youth. What fuller duty in life is there than guiding your children and helping them through difficulties. The revelational power of climbing: physical and mental, leads us to achieving beyond where we think our limits are (with a little help from fear / adrenaline, which you appreciate only after the climb!). Climbing offers very real yet simple challenges that are rare in our complex lives. On first scan through the book it dawns that the imagery is different. These are average climbers on climbs I’ve done, not the professional photo of the elite full-time athlete swinging their legs in the air on a desperate 30+ overhanging climb (they’ve got to have some payoff for campus boarding)… actually I’m beginning to dislike those shots, impressive as they are the first 200 times you see them. Photography tends to exploit the extraordinary to simulate drama that can’t be captured in a 2D image. As climbers we know the drama of being there, especially the climbs in 17 Down Under, and I feel this has been captured by climbers photographing climbers. The quality is there though, and the overall design and colour balance of the book is good for all the printing technicalities that can go wrong. 17 Down Under is interesting in that it confers in me climbing relevance, even at my humble grades it makes me feel I have a place in climbing. A friend questioned the self deferential humour on this blog and I realised I send myself up to speak in the climbing world; being a moderate grade climber I’m of little relevance and so assume a deferential position. This books enables a feeling of relevance, acknowledging these are great climbs and achievements for the people who climb them. The personal nature of this book caused me to reflect on my own experience — climbing specific routes, and climbing in general. Having the shared ground of moderate grade climbing enables this reflection. Reading an elite climbers perspective, though interesting, is well out of my experience and so, abstract. In the years it took to complete this project Steve and John immersed themselves in: printing, self publishing, photography, writing, graphic design, and editing. This was a mammoth task, and a task well outside the fun bit of the actual climbing. Perseverance got them through the problems; perhaps this is one of the many things climbing teaches: just keep going and you’ll get there no matter how impossible it seems at the time. Congratulations to Steve and John on this effort. It has already formed the core of my climbing trip planning (actual and imagined trips) climbs I can do that are treated with respect in 17 Down Under. You can order it directly from the team at Rock Hardware. There is also a great interview with Steve and John on Vertical Life, and a promo film. Really appreciate your considered and kind thoughts. I am extremely proud of John and the immense effort he contributed to tell our story. It is really important to be on the same page as your children, given the opportunity. I am waiting with anticipation to see what John’s next project might be and hopefully I can be part of that also. Pretty sure it will be climbing related. I have been thinking about why climbing provided the platform John and I were looking for. I believe it has been an “active meditation” for us and will continue to be. Perhaps others might be inspired to try our sport?